It has been 75 days since we pulled up stakes and skedaddled out of NY to escape the remainder of the winter. It has been a wonderful ten weeks. After a nice few days in Savannah, GA, we moved on to Jacksonville, FL, where we stayed for the month of February. Our main reason for the month-long stay in Jacksonville was to be able to spend some time with Harry’s sister Linda. We also took a couple trips to St. Augustine. On March 1st, we traveled a bit further south to Williston, FL, a small town near the city of Gainesville. It’s really hard to pick a favorite experience here, but close to the top has to be our hike at Barr Hammock Preserve. Joining in the fun for the Florida chapter Heartland rally and meeting some new friends is way up there too! Oh, and I can’t forget about going to the Botanical Gardens and Cedar Key! It sure has been such a wonderful two and a half months. Our time in the south for this winter is coming to an end. On Monday morning, we will put wheels to the road and head out for Woodbine, GA, our first stop on our northward trek. April is going to be a whirlwind month with a trip to Pennsylvania for a Heartland Owners campout, after which we will head to South Dakota to get our drivers licenses. It’s just about time to get this show back on the road! One of the day trips that we’ve been looking forward to this month is a visit to Cedar Key. It’s an easy trip, only 56 miles and no busy highways involved! As we arrived right around lunchtime, we decided to start with some refueling. We went to a place called Tony’s Seafood Restaurant, and was it ever good. They boast of their award-winning clam chowder and it wasn’t an idle claim. It was a cozy establishment, but we had a nice view out the window by our table. After our lunch, which was SO wonderful, we spent a couple hours just walking around the town, enjoying the great ocean views. This picture is not zoomed! It is the closest I have ever been to a pelican. Another great day in the books! Where Did All This Room Come From? We felt really good yesterday about our progress getting weight out of the fiver. This morning after we had our coffee we took a look at the couple other cupboards that we hadn’t looked through yesterday. We managed to find another 26.4 pounds to take to the dumpster! That is now a total of 213.6 pounds GONE since yesterday morning. On top of the weight we have gotten rid of completely, we’ve also managed to relocate 160 pounds from the front of the fiver to the living area, and we’ve moved 114 pounds from the basement to the truck. In all, that brings us to a total of 487.7 pounds off the pin. Like I said, we are feeling really good about how much we’ve accomplished in the past two days. These baskets were in the night stand next to my side of the bed. After we got rid of most of the stuff in this cupboard, we were able to move the baskets to the living room area. We have a lot of our “medical” type stuff in one of the baskets, so it’s more accessible here anyway. Plus I love the look of the baskets, and now I can actually see them! These baskets in the bedroom are empty! I will use these to store stuff from the bedroom when we are traveling…the small stuff that sits on our nightstands, etc. Look at our closet spaces! We can see the floor! Our hiking boots actually have their own spot now. I don’t think we had empty space like this last year when we were just traveling on vacations. We have made some great progress in downsizing in just a couple days. We still plan to sell the generator when we get back to NY, and we also have a few items that we are going to add to the containers hanging out in my sister’s basement. We are also going to pare down our extra supplies – food, paper products, stuff like that. We have already been trying to buy stuff as we need it, and we will just increase our efforts in this area. Tomorrow, we are heading to Cedar Key for the day. Lots of pictures to follow, of course! After our weight results from yesterday, we got up today ready to tackle looking through our cupboards and storage space. One thought I had yesterday was to combine our three first aid kits. After going through all of them and sorting out the expired medications, we combined the good stuff into the one small first aid kit. As we started going through stuff, the piles started accumulating throughout the living area. After we finished going through the bedroom closet and drawers, we headed out to the basement. We sorted through our “file” box getting rid of paperwork we no longer need. We also went through all of our boxes in the basement pulling out things we haven’t used…a propane lantern, a picnic backpack, computer cables, and stuff like that. We removed, threw out, donated….187.2 pounds of STUFF today. We took all this stuff to Good Will! How is it possible to still have clothes to get rid of after the bags and bags we already took to the clothing donation box? We also moved some stuff around. Our door side was lighter, and below max capacity by 600 pounds. We were heavy on the pin so we moved some items from the bedroom closet and basement out to the living room…104 pounds altogether. We still have some cupboards to go through, but the one big thing that we have decided to get rid of is the generator. We didn’t buy it for the fiver, but just brought it along in case we needed it some time. We are not boondockers, so we have decided that it isn’t worth carrying it around for the odd occasion when it might come in handy. Look how neat and tidy our basement is now! it was time for our reward!! No, not me! I’ve been getting on that scale pretty frequently in the past several months. But today was the first time on the scale for our rig. A company called Weigh-It had been in touch with the Florida chapter leader, and enough people were interested in getting weighed to make it worth their while to come for the weekend. Our appointment for weighing was at 1 pm this afternoon, and we packed up this morning so that we would be in “moving mode” for the weigh-in. We didn’t really have to rush around, so it made for a pretty laid-back morning. A little before 1 pm, we hooked up so we would be ready to get on those scales. It felt a little weird to be hitching up and yet know we weren’t going anywhere. The couple doing the weighing arrived right on time, and Harry maneuvered us back and forth, getting us into position on the scales. They took down the weights and let us know that we would get the results later in the afternoon. We spent the time getting ourselves somewhat unpacked again. A couple hours later, Bill from Weigh-It came back with our results. We have a good news, bad news situation. Good news is…our wheels and axles are all under their capacity limits. However (bad news), our truck is a little over its weight limit and our overall trailer weight is a little more than a little over. So…we need to do some paring down. Tomorrow we are going to take a look at what we are carrying in our basement and bedroom storage, and see what we can get rid of in there. Our trailer is going on a diet! I can’t believe it’s been five days since I last posted a blog entry; we’ve been busy having a good time, chatting and socializing. 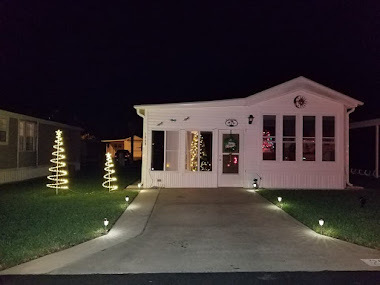 It was a couple months ago that I noticed that the Florida chapter of the Heartland Owners Group was planning a rally right at the campground we were staying at for the month of March. For the past couple weeks we have been getting to know other Heartland owners that arrived early for the rally. We met Larry and Sam, fellow Landmark owners and brand-new fulltimers when they arrived here early in March. Last week we went to try out a restaurant in the area that had been recommended to us. Here is Harry about to try gator tail bites for the first time! Something else that happened this past week was the completion of a repair job. I don’t think I ever posted about the little issue we had with our slide topper. When we arrived here and put our living room slide out, we heard a weird, not-so-pleasant noise and checked out our slide to see a not-so-pleasant sight. Luckily there is a repair guy here that seems to spend a lot of his time in this campground. We called him and he came by to take a look at the awning. Turned out that the awning had a bend in the center, probably right from when it was installed. The tension on the awning eventually caused the spring to snap, which probably was the not-so-pleasant noise we heard. The parts were ordered and we were glad that we had already planned to be here for the month. …and Friday they installed it. Yay! We are happy to once again have all our parts in order. We also had a nice coffee get together on Friday morning. Randy and Karen are interested in a possible fulltiming lifestyle, so we got together with them and Larry and Sam to chat about our respective journeys. We’ve also been to the usual “too much good food” potluck and a yummy catered bbq dinner. It’s really been an awesome week. Now we are sadly waving good-bye as people head out in all directions. We are here for one more week, but the place is sure going to seem empty now after such a great time with so many great new friends.